Railroads abandoned and later rediscovered hold a certain mysterious and captivating quality. Some of my fondest childhood memories are of treks through the English countryside, following old tracks as they boorishly carved their way through rolling hills and deciduous woodlands. So when I heard of a passenger train service on a restored 19th-century railroad in the Santa Cruz mountains, I had to take a journey on the Roaring Camp Railroads for myself. This being America, of course, everything exists on a much greater scale than in my humble England. 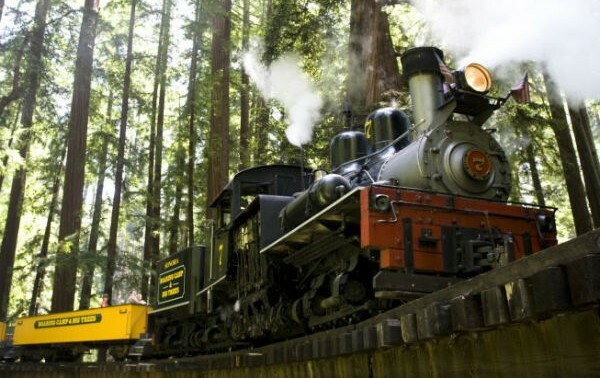 The Santa Cruz-Felton railroad runs through forests of coastal redwoods that are 300 feet tall and 1800 years old, some of the oldest and largest living organisms on Earth. But magnificent scenery is only one facet of the journey—I found the greatest enjoyment in Roaring Camp’s ability to transport its visitors back to a time when the railroad was still king and the Wild West was yet to be tamed. A glimpse from Roaring Camp’s past. Roaring Camp itself was one of the first settlements and saw mills west of Colorado, and nearby Welch’s Grove the first area of coastal redwoods to be protected from logging. Today’s re-creation of the 1880s logging town features a general store, America’s smallest covered bridge, and myriad activities from candle-making to panning for gold. Its restored trains complete the experience, and knowledgeable guides relay the fascinating history, dropping in many a funny anecdote to keep the atmosphere lighthearted. The original Santa Cruz-Felton line was quickly extended to Los Gatos, San Jose, and along the eastern edge of the San Francisco Bay into Oakland and Alameda. It was so popular with day-trippers from the Bay Area that it became affectionately known as the “Picnic Line.” In 1939, however, a severe storm prompted Southern Pacific to abandon the line, and in 1982 the remaining Santa Cruz-Felton branch was closed too. In the 1980s, Norman Clark purchased the route from Southern Pacific and revived the classic Santa Cruz-Felton section of the Picnic Line line for the enjoyment of modern-day picnickers. Today Roaring Camp offers two railroad lines and hosts a variety of special events throughout the year. Here are some of your options for hopping aboard. Departures: The train runs year-round, with daily departures from Roaring Camp. Check the schedule for departure times, as these vary by season. Experience: The steepest narrow-gauge railroad in North America, the Redwood Forest Steam Train winds its way up to the summit of Bear Mountain, climbing timber trestles up to 40 feet tall. There’s a real feeling of suspense before the train tackles the sharpest inclines. As the driver pauses to prepare, guides whip passengers into a chorus of cheers to will the 19th-century engine up the tracks. At the summit, passengers can disembark briefly. In this dense redwood forest, sweeping views are not on the agenda—although some brief majestic glimpses of the Santa Cruz Mountains can be had on the way back down. Make it a day trip: The Roaring Camp station in Felton offers a free pedestrian entrance to Henry Cowell Redwoods State Park, which has more than 15 miles of hiking trails with great picnic spots above the San Lorenzo River. The entrance is close to the Redwood Grove Trail, a gentle 1-mile loop around Welch’s Grove and its historic, still-protected redwoods. Alternatively, you can bike or catch bus 35 to Santa Cruz (about an hour journey either way), where you can enjoy a hearty brunch at Zachary’s (819 Pacific Avenue, 7am-2.30pm) before strolling down Pacific Avenue to check out some of the quirky stores and boutiques. Departures: The summer-only train runs regular departures from Roaring Camp or the Santa Cruz Beach Boardwalk, daily from June through mid-August and on weekends through the end of September. Experience: Also known as the Beach Train, the Big Trees and Pacific Railroad follows the original 1875 Felton-Santa Cruz route, one of the oldest lines in California. The railroad runs alongside the beautiful San Lorenzo River Gorge and into Downtown Santa Cruz on its way to the coast. Passengers at Roaring Camp in Felton or on the Beach Boardwalk in Santa Cruz. Make it a day trip: Take the Beach Train from Felton and spend a day playing on Santa Cruz’s historic Beach Boardwalk. Get your kicks on the 1924 Giant Dipper Roller Coaster, sample treats from cotton candy to deep-fried Twinkies, and stock up on salt-water taffy at Marini’s candy shop. Note: During the summer months, it’s also possible to ride the Beach Train and the Redwood Forest Steam Train in one day, if you catch the earliest return Beach Train from Roaring Camp to Santa Cruz, and then ride the Redwood Steam Train in the afternoon. Whether you’re a Civil War Re-enactor or an amateur ghost hunter, Roaring Camp’s got a special event that will suit you. Check out the events page for a full list of festivals and experiences, or whet your whistle with these regular special trains. Moonlight Dinner Party: Kick up your heels at Roaring Camp. This extravaganza includes a barbecue dinner, moonlight train ride, and campfire and sing-along on the summit of Bear Mountain. The evening wraps up back at camp for live country music and dancing. When: A few times a year (usually in early fall). Ghost Train: The Halloween celebration includes a train ride through the haunted forest as actors perform scenes from “The Legend of Sleepy Hollow” on stages along the tracks. The evening caps off with Halloween festivities at Camp. When: End of October (leading up to Halloween). Holiday Lights Train: Get into the holiday spirit with spiced cider and carols on a glittering train ride around Santa Cruz. Trains depart from and return to the Boardwalk, and the ticket price includes one activity (mini-golf, laser tag, arcade games…) at Santa’s Kingdom. Directions: Take Caltrain to the San Jose Diridon Station and catch the Highway 17 Express to the Cavallaro Transit Center. From there, take the 35/35A bus to Felton Faire, then walk or cycle about 1 mile south to Roaring Camp (the journey takes about 3.5 hours). Alternatively, you can drive (parking costs $8) to Felton and leave your car at Roaring Camp to explore the park or Santa Cruz car-free (roaringcamp.com).